A foodie paradise can exist in real time. When you hear statements like: “Nourishing the planet in harmony with nature and maintaining the fertility of the soil; they are the guardians of biodiversity and community well-being.” It sounds like a Utopian dream or a foodie’s ‘Shangri-la’. Yet, this foodie paradise exists, not in a parallel universe but in real time. 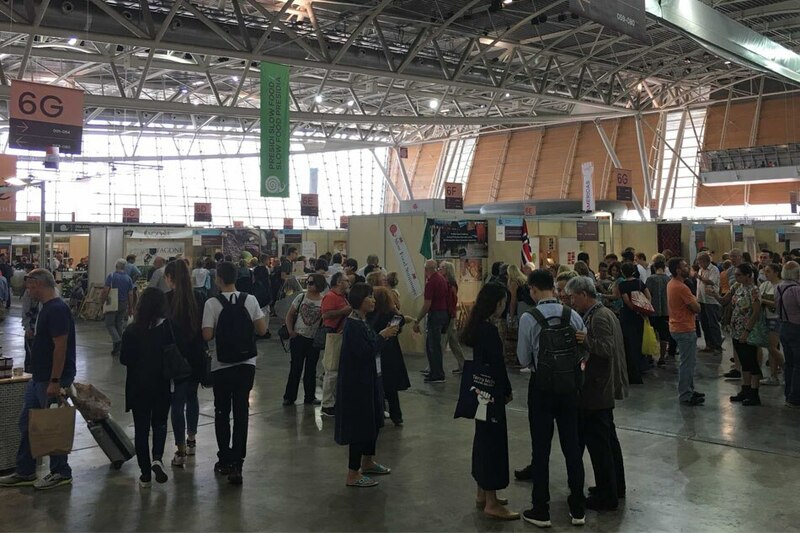 From Abruzzo to Zagreb, thousands of local chapter members of Slow Food, known as convivium, converged on the city of Turin, Italy, for the 12th Terra Madre and Salone Del Gusto 2018 biannual event. This is where gourmands, farmers, herders, fisher folk, artisans, chefs, and food activists come together to represent and share a sustainable model for producing food. To describe Terra Madre as overwhelming is an understatement. 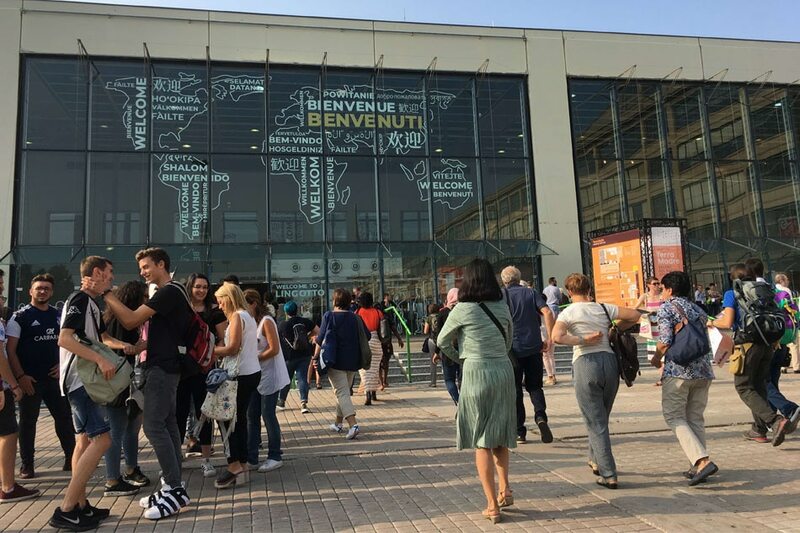 The three pavilions within the Lingotto Fiere hosted more than 900 exhibitors, Slow Food Presidia, and food communities from over 100 countries. Also included were, of course, products from Italy, with many offering free tastings of pasta, cured meat, wine, and cheese. 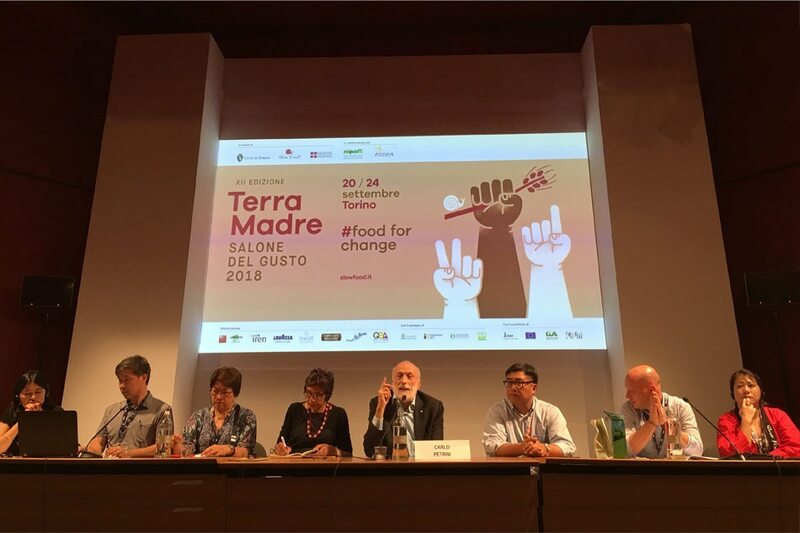 This year’s theme in Terra Madre Salone del Gusto was #foodforchange. In its quest to tell the story in an innovative manner and to communicate the messages in text, images, and actual objects, Slow Food created thematic exhibit areas designed to be tactile and experiential. The five themes were: Slow Meat, Slow Fish, Seeds, Food and Health, Bees and Insects. Founded by Carlo Petrini in 1989 following his public eating of pasta on the Spanish Steps in protest against the building of a well-known fast food chain in the Italian capital, Slow Food has become a global organization. 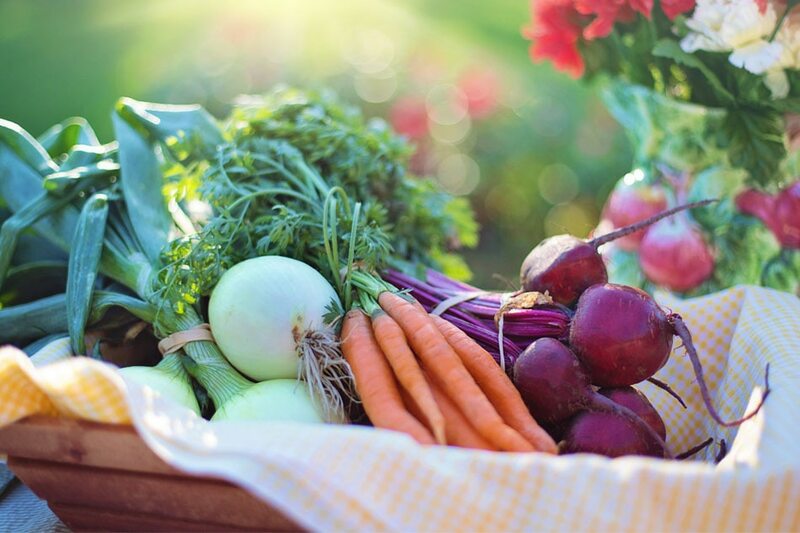 Over time, the objectives of the movement have become more focused with the emphasis now on preserving local food culture and traditions, counteracting the rise of fast life, and addressing people’s dwindling interest in the food they eat, where it is sourced and how our food choices affect the world around us. 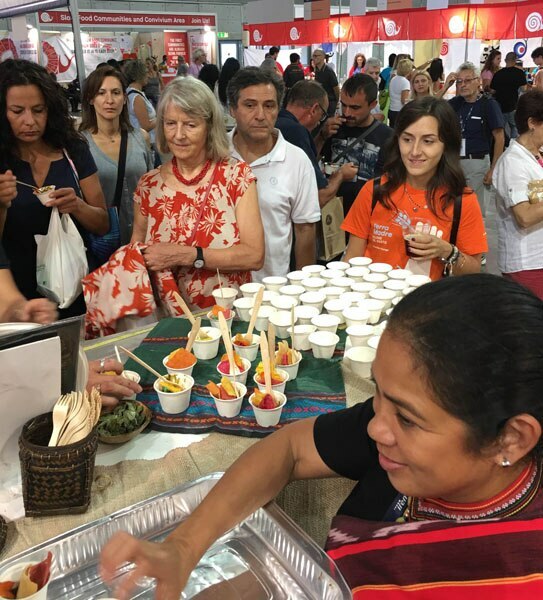 Each Slow Food member around the world is part of a convivium, a local chapter that brings the Slow Food philosophy to life through events and activities organized within their communities. These can vary from simple shared meals and tastings to visits to local producers and farms, conferences and discussions, film screenings, festivals, and tasting workshops. The Philippines has been well represented at this event since 2014. Vigorously working to make the country’s presence felt in Turin were Slow Food Asia Pacific Coordinator, Social Entrepreneur, and local coffee advocate Chit Juan, organic farmer and leader of Slow Food Manila convivium Paula Aberasturi, and Chef Jam Melchor who, ably supported by delegates from Slow Food Convivia of Manila and Cebu along with representatives from Sagada, Kalinga, also leads the Slow Food Youth Network Philippines. 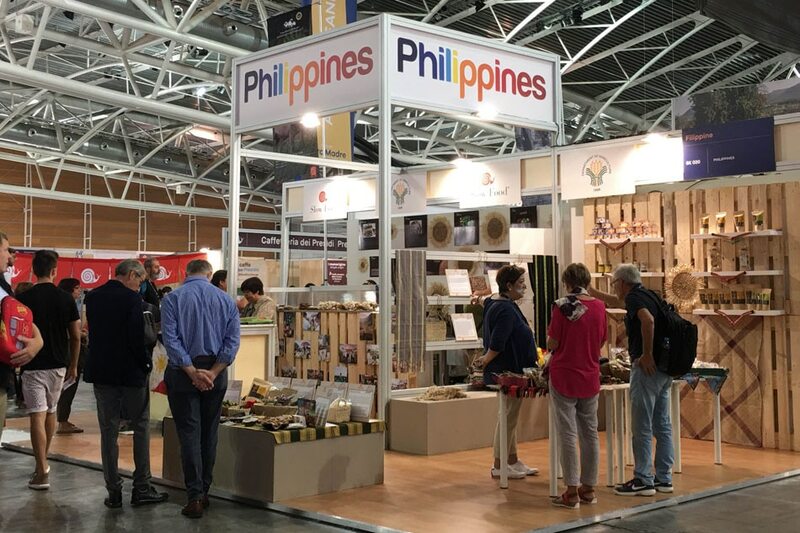 With the support of the Department of Agriculture, the Non-Timber Forest Products of the Philippines, fruit and vegetables such as calamansi, batuan, adlai, and rice varieties from the mountain province were showcased in the well-appointed Philippine booth, complete with multi-level display racks, a working kitchen, and staging area for cooking demos and live cocktail mixing. 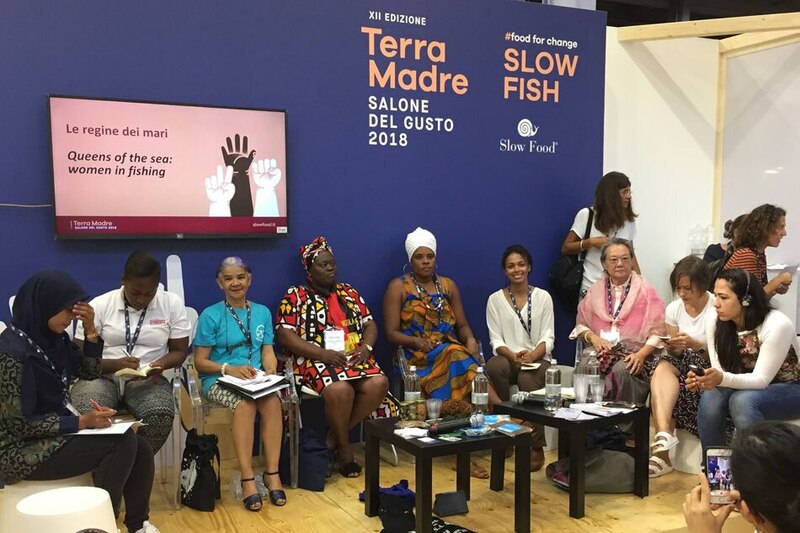 In one of the forums, Queen of the Seas, Women in Fishing held at the Slow Fish exhibit area, Laida Lim Perez of the famed Café by the Ruins in Baguio shared her knowledge of patis and how eating local can be considered a political act. She was joined by other women from Angola, Brazil, South Africa, Thailand, and the Caribbean, to discuss the challenges that beset women in this male-dominated industry. 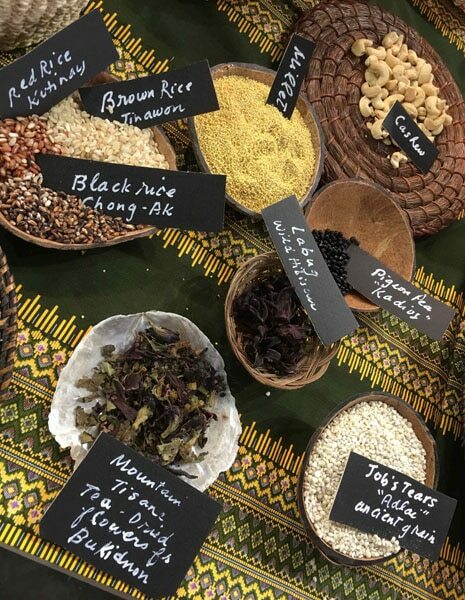 Meanwhile in the seeds exhibit area, Chef Jam was carrying an immense burden of expectation from the audience when he conducted a sold-out taste workshop entitled: Philippines: The Land of Rice. 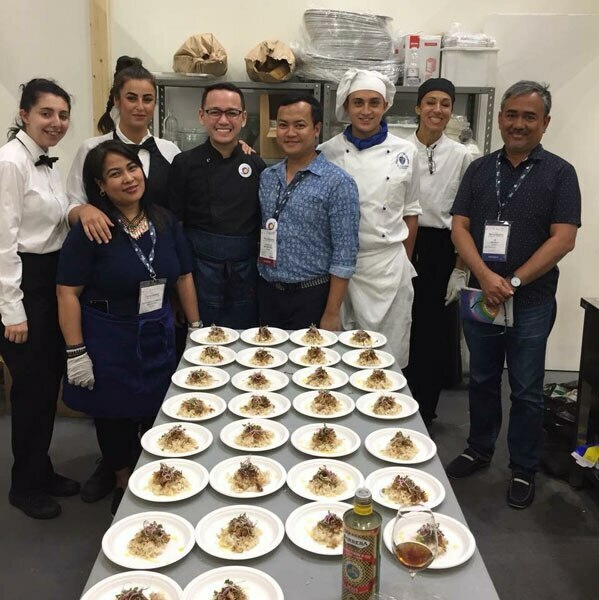 The young chef wowed the international audience by presenting steamed Tinawon rice topped with chicken and pork adobo and Lelut mais, made with Ominio, a sticky, glutinous rice cooked in coconut milk, and topped with sweet corn. The workshop was moderated by Chit Juan with Kalinga delegates: Chao-ig Malannag, Lam-en, and Rowena Gonnay explaining the rice cycle to the audience. Chef Jam was a sensation, especially to the members of the Slow Food Youth Network, when he presented the Bicol pili nut delicacy, Conserva. Standing on top of a table, he evangelized the use of dried leaf-wrapped confection to the devotees. 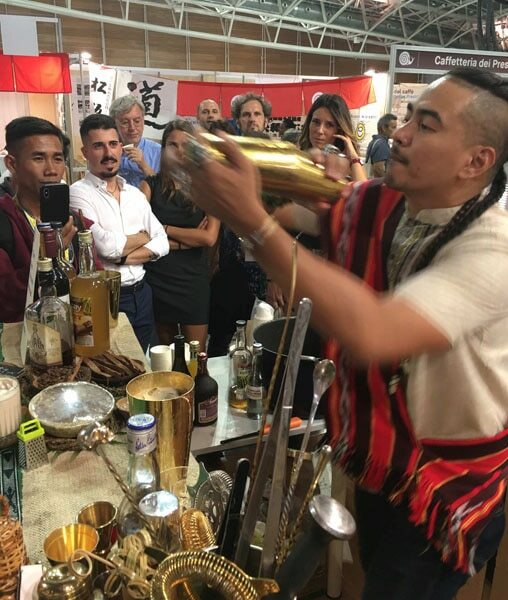 Located in the center of the Pavilion 3, the Philippine booth became a natural epicenter from where the energy of the Filipino spirit radiated every afternoon as the Liquido Maestro, Kalel Demetrio, danced with supreme verve and flexibility as he created his unique cocktails. 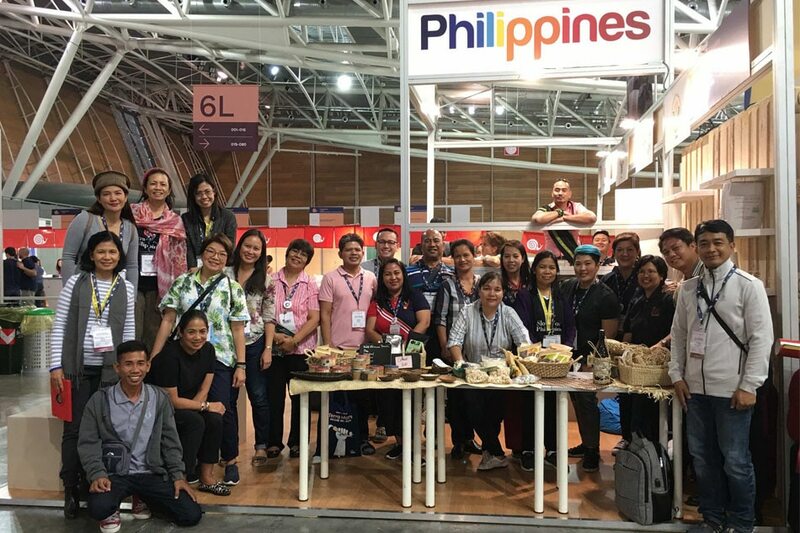 Meanwhile, UNISG Alumni Rae Macapagal, Slow Food Manila’s Reena Francisco, and Paula Aberasturi took turns in manning the booth while the Department of Agriculture representatives, Ning Carlos, Ronaldo Cadarrao, and Adelina Losa made sure the exhibit was fully stocked. 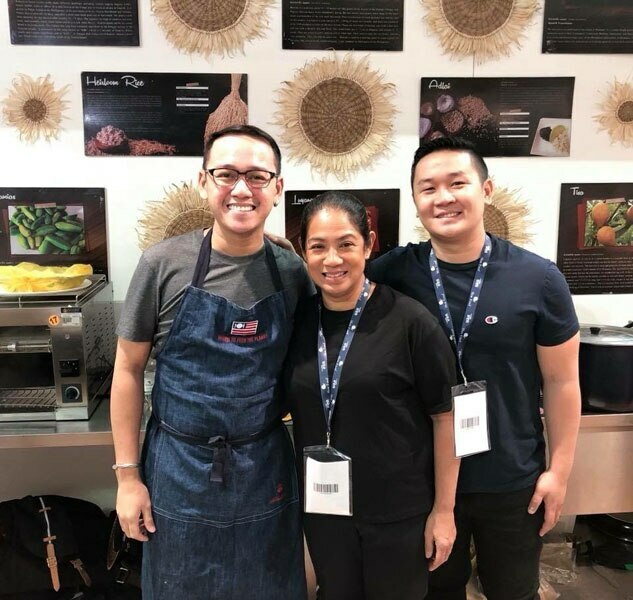 The group from the Cebu Convivium, Aurora Perez, Teresa Ruelas, and Ivan Mark Diez was working the kitchen and stage where, much to the surprise of the neighboring booths of island nations, they created suman and budbud using banana leaf as packaging material. Chef Margarita Forés, together with Noah Esguerra and Angelo Comsti cooked a mean adlai, budbud kabug, and laing. All in all, the Philippine participation in this year’s Terra Madre proved that if Filipinos have the will to work together for the common good, we could achieve such greatness that no one will be hungry again.